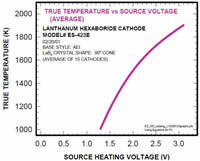 The Kimball Physics ES-423E (Extended Life) Lanthanum Hexaboride (LaB6) Cathode is a high performance, resistively heated, thermionic electron source. It is used in many brightness-limited electron optical systems including SEMs, TEMs, probes, and electron lithography systems. The emitter is a 15 mm diameter (standard) oriented-single-crystal, <100> surface (standard) mounted on the end of a single-piece, stress-free carbon heater rod, held in place by a carbon ferrule. The model ES-423 is available with the LaB6 crystal cut at a cone angle of 60° or 90° and a microflat size from 2 mm to 320 mm. These dimensions are included in the part number, the standard ES-423E style 90-15, having a 90° cone with a 15 mm microflat. The LaB6 cathode is available mounted on a standard AEI base, a Kimball Physics CB-104 ceramic base, or on a variety of custom bases for particular SEM or TEM systems. Cathodes are fragile and caution must be used in handling. The cathodes are shipped vacuum clean and ready to install. Note: Do not touch the cathode structure itself, only the cathode base. It is highly recommended to use clean room gloves in order to keep parts free of fingerprints and other contaminants. Place the purple base on a level surface. Hold onto the lower part (purple) of the shipping container, while unscrewing the upper, plexiglass cover and remove it vertically to avoid hitting the cathode. Grasp the edges of the cathode base and depress the push button on the side of the container to release the cathode base (and whole assembly). Carefully lift off the cathode assembly. A vacuum of 1 x 10-6 torr or better is required for proper operation of the cathode, but is not satisfactory for long-life operation. For longer lifetimes, pressure of less than 5 x 10-7 torr, preferably 1 x 10-7 torr, is required. 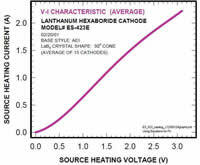 Cathode lifetime will increase as the vacuum is reduced to the 10-8 torr range. Follow the initial start-up procedure recommended by the manufacturer. This serves the purpose of outgassing water vapor form inside the Wehnelt cap (water vapor forms oxides on the LaB6 surface) and removes any oxides that have already formed on the LaB6 surface. Alternatively, for outgassing, run the cathode at reduced power (about 1.9V at 1.4A) for 15 to 20 minutes. During this initial run-up, the pressure in the gun will increase and should not be allowed to exceed 1x10-6 torr. The temperature should be adjusted up to the normal operating temperature gradually so that pressures do not exceed 1x10-6 torr in the process. For operation, pressures of 10-7 torr are recommended. 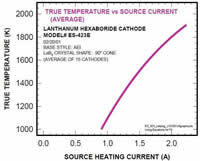 The ES-423E cathode is designed to resist thermal shock: after the initial run-up and outgassing of the Wehnelt, the cathode can be turned off and on to maximum current instantly. During typical operation, the temperature of the LaB6 crystal is in the range of 1700K (~1.73A) to the maximum high brightness temperature of 1900K (~2.12A) (1425°C to 1625°C). Increasing the power gradually, in small increments, will enable the operator to stop at saturation. The cathode power at saturation will depend on the setting of the bias resistor value. The onset of saturation should be observed with the aid of the cross-over image in TEMs or the electron emission pattern (EMP) in SEMs. Always run the cathode at the minimum power necessary for adequate emission at saturation. As with all cathodes, there is a compromise between operating lifetime and total emission current or brightness. 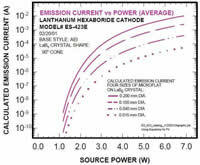 See "ES-423E LaB6 Cathode Standard Operating Parameters" below for typical operating parameters of the cathode. Caution: Operating the cathode above 2.1A will limit the lifetime of the cathode to a few hundred hours. The <100> surface of a truncated cathode is sensitive to gas evolution from the condenser lens liner tube during the initial stages of use. Gas pulses, due to electron desorption or heating, can result in emission current variations, which result in sudden changes in the appearance of the cross-over image or the EMP. These patterns will expand or contract symmetrically about their center. This effect can persist for a period of about one day in some instruments, while in others, the effect is small and frequently not noticed. Sudden sideways motions of the cross-over image or the emission pattern are most likely due to contamination of the Wehnelt aperture or the liner tube in the region of the condenser lenses. The above instabilities should not be attributed to the cathode, but to contamination of the surfaces within the instrument during loading of the cathode.